Hadron Dinghies have two demo boats which can be transported to your club for a demo day or weekend. To arrange an event at your club, see our contact details here. “The wind was relatively light but did fill in to enable a few good planing reaches and to get a feel for the power on a beat. I spent about 45 mins sailing. My biggest concern was whether as a relative lightweight at 70Kg it would be just too much for me, but I’m pleased to find that it was fine and much more controllable than my 300. The H2 is clearly light for it’s size and easily driven so I think using the considerable depowering capability it should still perform reasonably at my weight. I like the responsiveness. 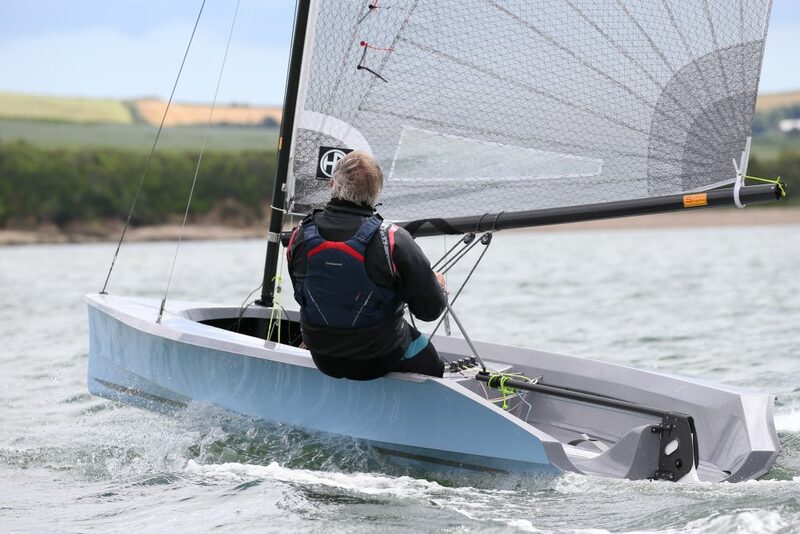 Coming from a 300 pretty much every boat has better initial stability, but it still does feel that it can roll and respond to heel nicely. I did stumble across the buoyancy tank a couple of times before working out the right step over it, and mid tack couldn’t decide whether to pass the extension forward or back, but the boat just sat on the chine showing great secondary stability until I worked it all out. I liked that it can be roll tacked well but it’s hard to over do it, so you don’t get a bucket full of water on each tack. I think I’d need some practice to get the roll and the exit point right, I felt I kept over doing the tacks. Gybes were a breeze. I found the sheet loads quite high on the beat. I really don’t like mainsheet cleats and find them never at quite the right angle for me, but would need it for long windier beats. I took the sheet straight off the boom for a while and found it almost lighter to handle from there. certainly more controllable. That’s how I sail my other boats so it’s great to have the option. The rig is clearly very adjustable – I’d have a lot to learn to get the best out of kicker and Cunningham, never mind rake and rig tension – lot’s to play with. I’d want to spend some more time playing around on a run. I like the unstayed ability of the 300 to go deep by the lee, and find that even with my stayed Farr 3.7 I can let the kicker right off and go almost as deep. On the H2 I couldn’t do this as well. The loose kicker allows the fat head to fall right off but the shroud base does not allow the main to square off so far and I struggled to hold the hull heeling to windward. I’m sure with more practice and experiment this could all be optimised. It’s nice and light for its size. Lovely trolley so it’s easily handled on the shore. Nice to have a centreboard, especially with the easy uphaul / downhaul controls.